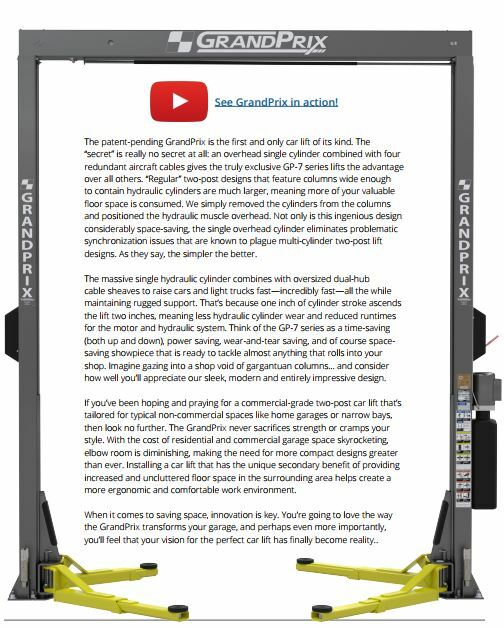 BendPak GrandPrix GP-7LC Low Ceiling - Height 118.5"
A one-of-a-kind lift is about to hit the market. The GrandPrix GP-7 series comes in three varieties and fits in garages with ceilings as low as 9 feet high. The GrandPrix redefines possibility from a two-post lift design—without breaking the bank. Specifically engineered with the home user and space-constrained shop mechanic in mind, the GrandPrix is equipped with Bi-metric™ arms suited for both symmetric and asymmetric handling of vehicles. That means if you want more door-opening clearance with cars positioned farther to the rear, the Bi-metric arms can accommodate your needs. Or, if you’re more of a “center-is-better” type, the purposefully designed dual-positioning arm configuration can handle that too. Specifically equipped with telescoping low-profile arms, all three GrandPrix models are ready to tackle low groundclearance vehicles such as race cars and modified imports. Of course, with a robust 7,000-lb. lifting capacity, light-duty trucks and SUVs are no problem at all. If you work with low ground-clearance vehicles, such as race cars, sports cars and modifieds, you’ll appreciate the ground-hugging profile our Low-Pro arms have to offer. These telescoping arms rest lower to the ground, making it possible to service low-stance vehicles. The GrandPrix is equipped with Bi-metric™ arms suited for both symmetric and asymmetric handling of vehicles. Variable arm positioning for either symmetrical or asymmetrical configuration offers greater versatility for increased service capabilities. It’s like having 2 car lifts in 1. Unobstructed door-opening clearance and door damage prevention are essential aspects in every two-post design. Mitigating risk of door dents and dings starts out by eliminating the risk entirely. That’s why our arm tube supports are lowered and gradually tapered, providing unhindered range of motion when opening vehicle doors. The telescoping arms of the GrandPrix series feature arm restraints that interlock automatically when the lift rises off the ground, adding an added measure of safety and assurance that the arms will be held strongly in place during use. When the lift is lowered to the ground, the restraints disengage. This enables free movement of the arms, so they can be moved out of the way for easy vehicle exit. Our standard electric-hydraulic power unit is built with precision components that assure trouble-free operation and maximum durability. Ergonomic controls combine with automatic safety locks to permit simple and safe operation. 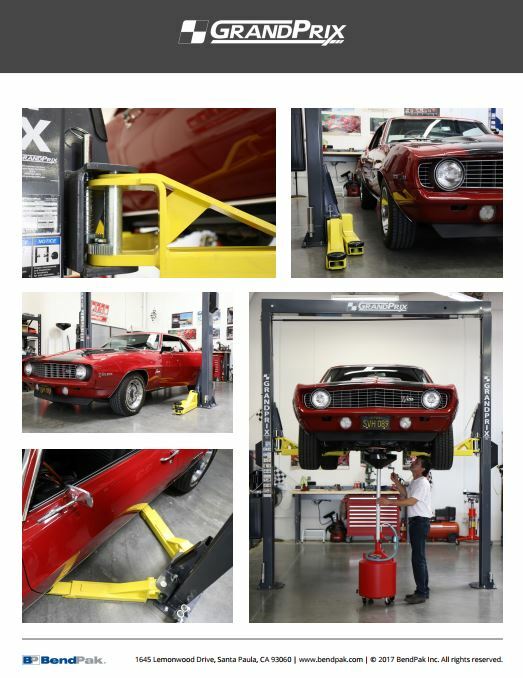 Lift carriages are the lifting assemblies that the car lift arms attach to. 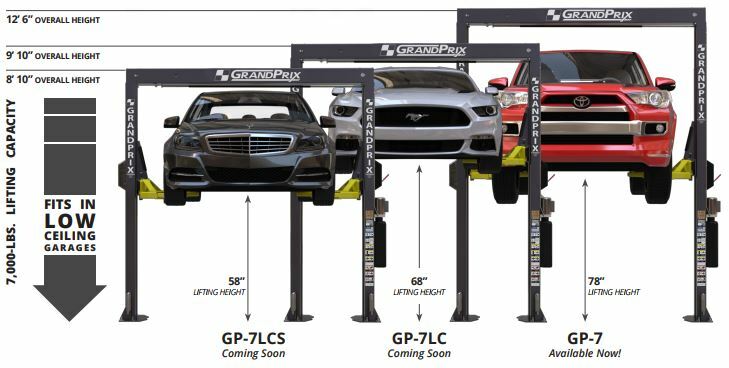 At a lofty 53” in height, our GP-7 two-post lift carriage is substantially taller than most other two-post designs, which enables us to reduce column, carriage and load bearing stresses. 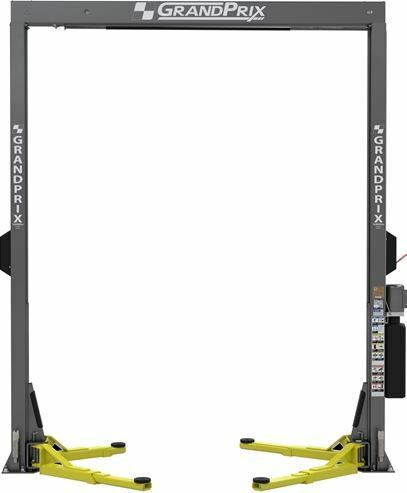 Rugged load-holding safety lock devices automatically engage and lock the lift structure as the car lift rises, preventing sudden free-fall in the unlikely event of suspension component failure. A convenient single-point safety lock handle releases both column locks simultaneously. For added safety, a secondary lock system acts as an automatic slack-cable device, automatically engaging in the event of an unexpected cable failure. A single overhead cylinder means no more problematic synchronization issues that are known to plague multi-cylinder two-post lift designs. Our proprietary hydraulic power system is teamed with oversized dual-hub cable sheaves that together deliver a 2:1 lifting ratio, raising cars and light trucks incredibly fast. The micro-smooth chrome piston rod is machined from high-yield C-1045/50 micro-alloy steel and is paired with an industrial single-piece, pilot-fitted, machined steel piston. High durometer, mechanically-loaded rod seals make leakage a thing of the past, while specially formulated abrasion-resistant urethane rod wipers provide extrusion protection. This combination of superb base materials and superior processing ensures optimum efficiency and longevity. An integrated flow restrictor provides a controlled descent in the case of an unexpected hose rupture. Each GrandPrix lift is supplied with four high-strength galvanized steel lifting cables, each with a tensile strength of over 15,000 pounds. That’s 60,000 pounds of brawny steel cable to safely support up to 7,000 pounds. Even though only two cables are actually necessary for a GrandPrix lift to operate, we purposely added two additional independent and totally separate cables to ride along as added security in the rare case of a cable failure. That means that if any one of the primary 15,000-pound cables fails, there is a backup cable on-guard, a load sentry that will quickly spring into action. Now comes the fun part. Let’s say that for whatever reason, a primary cable fails (highly unlikely). The backup cable will instantly take over the heavy lifting role. Now, imagine that for some apocalyptic reason, one of the secondary backup cables fails as well—what then? This is what our engineers are most proud of. 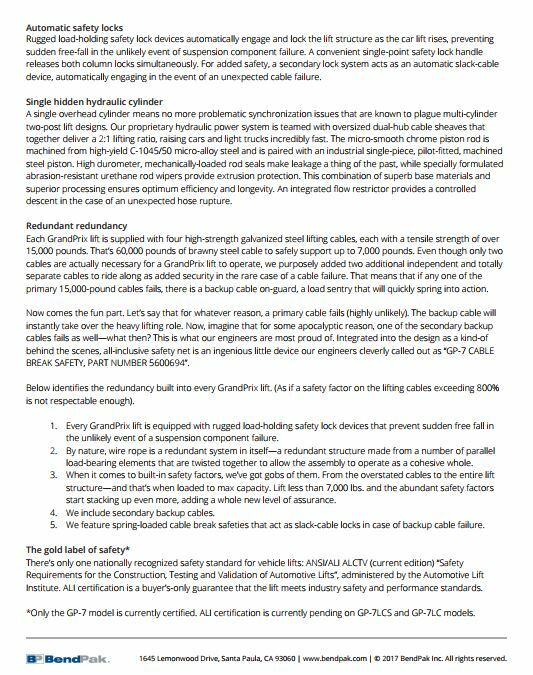 Integrated into the design as a kind-of behind the scenes, all-inclusive safety net is an ingenious little device our engineers cleverly called out as “GP-7 CABLE BREAK SAFETY, PART NUMBER 5600694”. 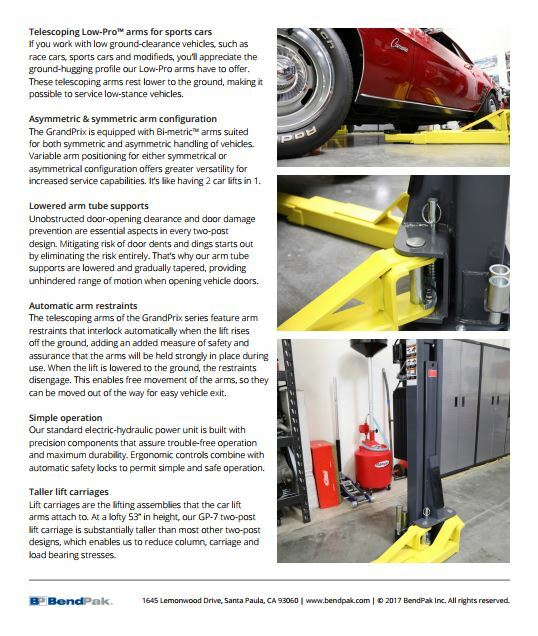 Every GrandPrix lift is equipped with rugged load-holding safety lock devices that prevent sudden free fall in the unlikely event of a suspension component failure. By nature, wire rope is a redundant system in itself—a redundant structure made from a number of parallel load-bearing elements that are twisted together to allow the assembly to operate as a cohesive whole. When it comes to built-in safety factors, we’ve got gobs of them. From the overstated cables to the entire lift structure—and that’s when loaded to max capacity. Lift less than 7,000 lbs. and the abundant safety factors start stacking up even more, adding a whole new level of assurance. We include secondary backup cables. 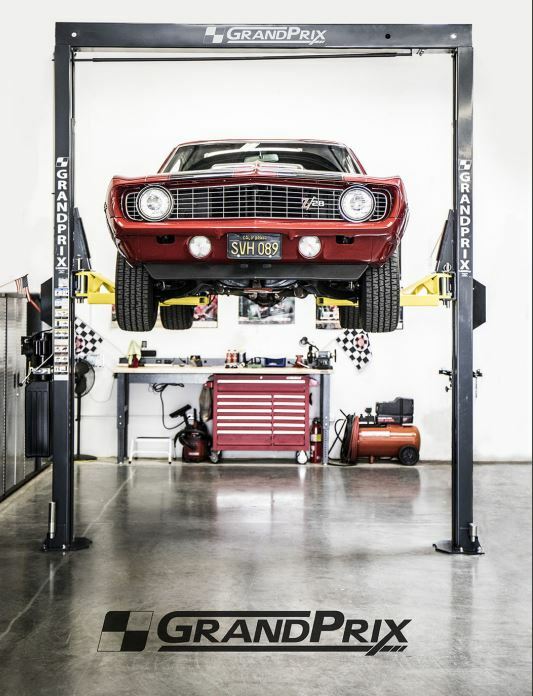 There’s only one nationally recognized safety standard for vehicle lifts: ANSI/ALI ALCTV (current edition) “Safety Requirements for the Construction, Testing and Validation of Automotive Lifts”, administered by the Automotive Lift Institute. ALI certification is a buyer’s-only guarantee that the lift meets industry safety and performance standards. *Only the GP-7 model is currently certified. 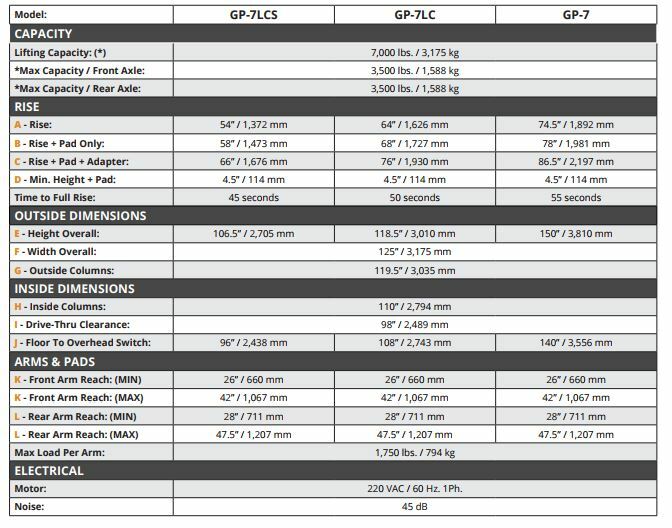 ALI certification is currently pending on GP-7LCS and GP-7LC models. Click the button below to add the BendPak GrandPrix GP-7LC Low Ceiling - Height 118.5" to your wish list.